For an institution recently described proudly by its own chief executive as "boring", allegations that it laundered money for Iran come as something of a shock. 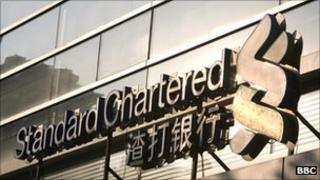 Standard Chartered Bank has an illustrious history - 43 years, in its current structure. But the roots of the Standard Bank of British South Africa and the Chartered Bank of India, Australia and China - the two banks which merged to create it in 1969 - stretch back more than 150 years. Before the merger, the Chartered Bank - founded by Scottish businessman James Wilson, who also set up the Economist magazine - played a major role in the development of major trade routes with the East, following the opening of the Suez Canal in 1869. At the same time, the Standard Bank, founded in the Cape Province of South Africa in 1862, was prominent in financing the development of the diamond fields of Kimberley from 1867. It later extended its network further north to the new town of Johannesburg when gold was discovered there in 1885. Standard Chartered sold its 39% stake in Standard Bank Group in 1987, transferring complete ownership of the holding company to South Africa. But now among the world's top five largest banks by market capitalisation, Standard Chartered has used these roots to capitalise on the expansion of trade between Europe, Asia and Africa. And despite retaining a London headquarters, 90% of its profits are now derived from Africa, Asia and the Middle East. It is this focus on Africa and Asia which has enabled Standard Chartered to escape from the 2008 financial crisis largely unscathed. And this, in turn, has given it until now a rather glowing reputation. Described just last week by an analyst as "simply the best, better than all the rest" following its strong interim results, Standard Chartered was one of the rare global banks with a reputation untarnished by the growing number of scandals. It is this reputation which has seen even the government turn to it for advice. In fact, Peter Sands, who was promoted from finance director to chief executive in November 2006, is widely believed to have been the brains behind the so-called "Balti bailout". This is the government's 2008 part-nationalisation of banks including RBS and Lloyds, thrashed out over a takeaway curry. Mr Sands himself is held in such high regard that he had been tipped as a candidate for the next governor of the Bank of England. The bank also has some illustrious past employees. John Major, who served as UK prime minister from 1990 to 1997, was hired by Standard Bank in May 1965 and continued to work for the merged bank until 1979. For his part, Mervyn Davies, Mr Sands' predecessor, became Lord Davies on his subsequent departure and elevation to Labour trade minister when the party was in power. The chairman of the Financial Services Authority, Lord Turner, was also a non-executive director for two years until late 2008. With a past like this, the idea that Standard Chartered should face accusations from the New York regulator of being "a rogue institution" has unsurprisingly sent shockwaves through the sector, with the allegations weighing heavily on its share price. Analyst house Nomura says Standard Chartered is still its preferred bank, based on its fundamentals, but says the risk of negative headlines following the allegations means it can no longer recommend that investors buy the shares. It has therefore downgraded its stance to "neutral". Michael Helsby, of Bank of America Merrill Lynch, also believes the underlying fundamentals and earnings growth of the group's businesses remain intact, but has downgraded its rating on the bank to "underperform", because of the impact on the share price. It could be that Mr Sands' words at last week's interim results, that Standard Chartered "may seem boring in contrast to what is going on elsewhere, but we see some virtue in being boring", may have come back to haunt him.